Light of Other Days Research Papers discuss Bob Shaw's science fiction novel that shows how life can be reflected from the inside out or from the outside in. The Light of Other Days by Bob Shaw is a brilliant work of science fiction that utilizes the characters of the Hagans and the Garlands to illustrate how life can be reflected in an individual from the inside out or from the outside in. The slow glass serves as a metaphor for this reflection and Shaw blatantly illustrates the superficial nature of outward appearances throughout the story. The Garlands are a well-to-do couple that is on a holiday in the countryside of England. Shaw uses the name “Garland” for the couple because they are much like the leaves or intertwined flowers that make up garland, they are tangled together to make up something beautiful or as a decoration. However, the Garlands looked like a charming couple on the outside but in reality, they hated each other and had a loathsome relationship. They were like a decoration, together on the outside for the sake of because of circumstance. Circumstance for the Garlands was a baby and a love that had as much hate in it as it did any other ingredient. Shaw gives the name Hagan to the slow glass seller due to his “haggard” outward appearance. His is the antithesis of the Garlands in that he appears deeply in love with his wife that the Garlands see in the window. However, this is an outward appearance and the true inward man is a haggard, lonely, sad individual who has lost his wife and child and has nothing left. The Garlands have the decorated outward appearance of everything Mr. Hagan had; Mr. Hagan’s life shows the destruction that tragedy has placed in his life against his will, making him a haggard man. 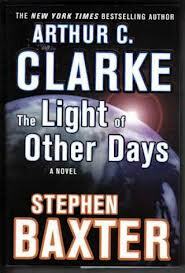 Paper Masters writes custom research papers on Light of Other Days and discuss Bob Shaw's science fiction novel that shows how life can be reflected from the inside out or from the outside in.